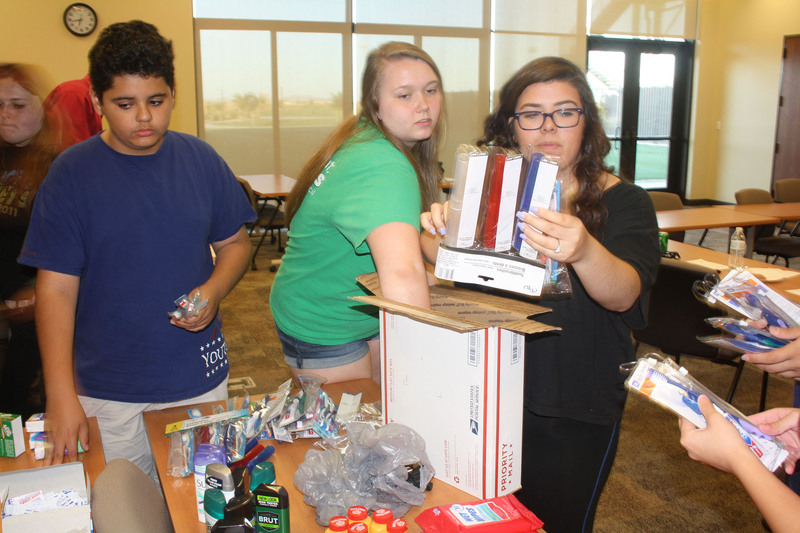 Members of the Maricopa Youth Council package items for the homeless. Photo by Raquel Hendrickson. If judged on good deeds, it was a fruitful session for the Maricopa Youth Council. The council wound down its term this week in typical fashion with a service project at its final meeting. Though not officially appointed until mid-December, the 14-member group was productive. “We’ve done more in a shorter amount of time than others had,” member Caitlynn Barnes said. Part of Tuesday’s meeting was dedicated to sorting through toiletry items donated by residents for Copa Care Boxes. That is a drive to provide basic necessities like blankets and hygiene products to area homeless people. The winter Copa Care Boxes gathered enough items to help 18 people. The summer drive is still in motion. Earlier, the council hosted a drive to register bone marrow donors. In two and a half hours of work at Copper Sky Recreation Center, they registered 34 people. The Youth Council members were involved in community events like Salsa Fest and Relay for Life. There was also Martin Luther King Jr. Day, Global Youth Service Day, field trips and the Crime Victims Rights poster contest. More relaxed than other city committee meetings, the Youth Council meetings are generally held at Copper Sky, and pizza is not uncommon. The council is comprised of high school and middle school students. With only two graduating, coordinator Heather Lozano encouraged everyone to apply again for the next appointments, if they were dedicated to the council. In reviewing the term, the members agreed there was a problem with unexcused absenteeism at meetings and events. City council members in attendance suggested they incorporate rules closer to those of other committees, which replace members with chronic absences. The members at the final meeting were Na Talya James, Alyssa Hollingsworth, Caitlynn Barnes, Evan Grace, Samantha Corrales, Alexis Lozano and Bianca Guzman. City Councilmember Vincent Manfredi praised the council for its work and ideas. All received pins for their volunteer service.